Ascending Butterfly: This weekend I'm taking a trip to the 100 Acre Wood - And so can YOU! 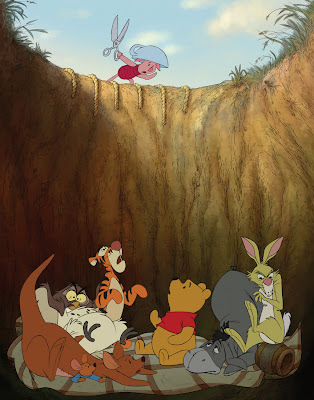 This weekend I'm taking a trip to the 100 Acre Wood - And so can YOU! I'll be attending the New York Screening of Winnie The Pooh this weekend, and I just can't wait! Winnie was one of my favorites, and I couldn't get enough of his adventures! Now I share that love with my younger niece and nephews. Sometimes my nephews are much like Tigger, bouncy, adventurous, silly and fun! While I can't take you all to the screening with me, I can leave you with some fun activities to try out with your little ones! 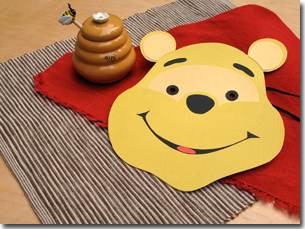 While I know it's a Tad early to be thinking Halloween, one of the activities that I thought was super cute, is a Winnie The Pooh Mask! No one says a Halloween costume has to be scary. Here's a cute disguise inspired by a honey of a bear who makes it his bees-ness to eat as much of the golden syrup as he can get his paws on. The sweetest part is how quick and easy this mask is to assemble. 1. Print out the template (pages 3 and 4) and cut out the pieces to use as patterns. First, cut out a head from the thin cardboard and set it aside (you'll use this to back the mask later). From the lighter shade of golden yellow paper, cut a second head and a muzzle. Cut the face shadow and the inner ears pieces out of the second shade of golden yellow. Then cut out eyes, eyebrows, a nose, and a mouth from black paper and a tongue from red paper. 2. To create the mask, start by gluing the inner ears in place on the paper head. Next, glue on the face shadow, positioning the top of it about 1 1/2 inches from the top of the head. Attach the eyebrows right above the face shadow. 3. Next, glue the nose onto the muzzle. Then glue the muzzle in place so that the lower edges match up with the bottom of the head and the top overlaps the face shadow. Glue on the mouth, positioning it about 1 3/4 inches up from the chin, and then stick on the tongue. 4. Place (but do not glue) the eyes on the mask and lightly trace around them. Remove the eyes and use the craft knife to cut a hole through the head within the lines of each tracing. Don't make the holes as big as the eyes -- instead, leave a 1/8-inch border between the hole and the pencil line. 5. Now punch a hole in the center of each of the black paper eyes to create a pair of black rings, and glue them in place around the eyeholes in the mask. At this point, have your child hold the mask up to his face to make sure he can see well. If not, use the craft knife to make the eyeholes larger. 6. Place the mask atop the cardboard backing to mark where the eyeholes are. Then cut matching holes in the cardboard. 7. Cut a piece of black sewing elastic to a length that's just a bit longer than needed to fit around the back of your child's head. Knot the elastic ends and staple them to the sides of the mask backing. 8. Finally, glue the mask onto the backing, matching up all the edges, and it's ready to wear. 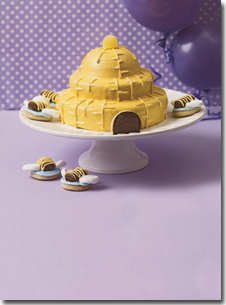 Create some buzz at your little honey’s garden-, flower-, or bug-themed party with this simple cake and its cookie swarm. 1. Use a long serrated knife to trim the tops of the round cakes flat, if needed. To get the smooth look, first stack the three cakes on a wire rack over a cookie sheet. Heat 3 cups of the yellow frosting in the microwave until it liquefies, about 20 seconds (remember microwave wattages vary so you may need to adjust this). Stir the frosting, then slowly pour it over the top of the cakes, covering them completely. Refrigerate the stack for about 30 minutes to harden the frosting. 2. Meanwhile, frost 12 of the cookies light blue and place a Twix in the center of each. Use scissors to cut the ends from the marshmallows and press on these ends, sticky side down, for wings. 3. Carefully transfer the cake to a platter. To add a door, trim one edge of the remaining cookie, cover both sides with chocolate frosting, then press it onto the hive. Spoon the rest of the yellow frosting into a resealable sandwich bag, snip off a corner, and pipe markings onto the bees and hive. Top the hive with the gumdrop and arrange the bees around it. Serves 12. FTC Disclosure: This is a NON-Sponsored Post. Permissions have been granted by @Disney to share the craft, recipe and photos with my readers!